Many people enjoy traveling with their pets. 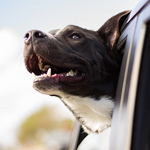 With that in mind, there are a number of pointers to bear in mind when it comes to traveling with pets. When your furry companion will be hitting the road with you, it is important to keep them in a carrier when the car is in motion. Allowing your pet to move around while the vehicle is moving can prove to be dangerous. You will also want to take breaks while traveling to allow you pet time outside of a carrier. This is necessary to ensure that your pet can relieve his or her self and have something to eat and a chance to drink some water. If you have any questions about preparing your vehicle for a road trip, visit our Volvo showroom. We are conveniently located and can assist you in getting ready for your travels.